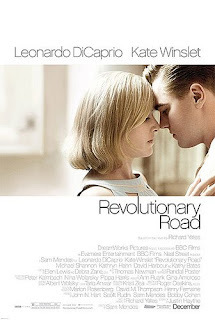 Set in the mid-1950's and based off the Richard Yates novel, Revolutionary Road follows a young couple in their pursual and struggle in maintaining their marriage in suburban Connecticut, while raising their two young children. Frank is distraught with his mundane job, while April mourns the realization of her fleeting acting career. In hopes to save the spoiling relationship and break the social confindes of suburbia, the two plan to move away to France, but face the realization that the endless cycle may be too great to break free from. Sam Mendes in Revolutionary Road, does an staggering job of examining the themes and social constraints intertwined with the 1950s in America. The writing and storytelling presented are Oscar worthy, especially when combined with the imposing character devlopment that is downright sensational. The score within Revolutionary Road perfectly captures the era and is beautifully matched creating an unsettling mood that builds to the melancholy finale. Kate Winslet easily steals Revolutionary Road in her performance of April Wheeler. Her portrayal is un-matched in 2008 and could potentially land the actress her sixth nomination for an Academy Award. Winslet maginfies her role every moment on screen and eclipses Leonardo DiCaprio in every way. Winslet's heartsick performance is both enthralling and despairing, so much so, it leaves the viewer completely speechless with the somber outcome. Leonardo DiCaprio on the other hand, misses the mark when compared to the talented Winslet. It is hard not to compare their rivaling performances, because so much of the film and the plot development rely soely on the two actors shared scenes. The 34 year old actor, who still dawns a babyface, feels dwarfed next to Winslet's magnificent performance. DiCaprio does have some strong moments, but the character development written in the script and his performance, simply do not match. While it was nice to finally see Winslet and DiCaprio back together on screen, another actor could have made this film so much more. DiCaprio, who I generally enjoy, unfortunately felt flat in Revolutionary Road. Luckily for him, the script and direction being so good, his lesser performance doesn't spoil the sorrowful film. The rest of the cast is exemplary throughout Revolutionary Road with highlights coming from Kathy Bates playing Mrs. Helen Givings and playing her son Michael Shannon (Shotgun Stories). Shannon delivers a superb performance that electrifies everytime he is one screen. Sadly, Shannon only has two or three scenes throughout. Bates delivers a staggering performance as a typical superficial suburban socialite, who is completely insincere in her sincerity. The supporting cast helps to build the Wheeler's restraints and adds another layer to the wonderful script that continues to hit the viewer throughout the 119 minute film. Revolutionary Road is an outstanding character study of the relationships and marital confindes in place in 1950s America. A generation that feels so far away in our modern society, set when women were expected to be at home as the homemaker with little choice in the matter. The development of the Wheeler family as they try to cope and break free from societies presumptions on married life is both stunning and heartbreaking. Finally Revolutionary Road really sends home it's mesage on marriage and how society, in the specific era, really cornered women into becoming subservient to their husbands. Watching Kate Winslet trying to break free from those traditions is a sight to behold and a reason to see Revolutionary Road.